When someone attempts to direct an adaptation of a William Faulkner novel, it's a safe guess that the director is looking to make some noise during awards season. But when it’s a James Franco film you’re talking about, all bets are off. It’s possible he only made the film because he had a dream that it was already done and he didn’t want to have to compete with his dream self. While it’s unknown how much Franco had to do with this decision, Millennium will be holding his adaptation of As I Lay Dying back from theaters, sending it straight to VOD, according to The Hollywood Reporter. The film was originally supposed to come out theatrically on Friday, September 27, but now it’ll just hit iTunes on October 22, before heading to the rest of the VOD platforms and DVD on November 5. Can that even happen? I mean, they do realize that Franco is at the apex of all saturation points, and that people would throw money to see him do just about anything. And this seemed like something of a prestige project, even though it was merely one of a half-dozen or so movies he’ll have been involved in directing this year, much less everything that he’s starring in. People would avoid one Franco movie specifically to go to another genre of movie with Franco in it. And it’s not as if it’s just him and a bunch of unknown actors, like Interior. Leather Bar. It also stars Tim Blake Nelson, Ahna O’Reilly, Beth Grant, Jim Parrack, Logan Marshall-Green and Danny McBride. It’s possible the multi-talented artist got in over his head with such complicated source material. Not in terms of storytelling, as As I Lay Dying can be broken down as an old timey road movie where a family comes together to bury their matriarch, and the problems that arise. But Faulkner used dozens of narrators to tell different parts of the story from their perspectives. It isn’t the easiest thing in the world to put to film, and the festival reception was lukewarm at best. Maybe their goal here will just be to let this make the money it does without pouring money into an ad campaign. Maybe this book cover scared everyone away. 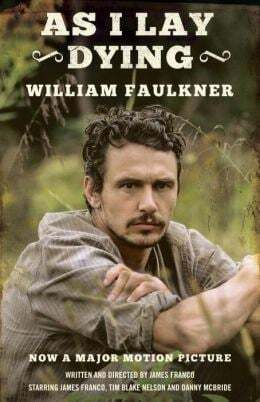 However it goes, it’s still only one of two Faulkner adaptations Franco has coming, with his take on The Sound and the Fury currently in pre-production. Here’s the trailer for As I Lay Dying, which I actually thought was pretty solid. But we all know trailers can be deceiving.